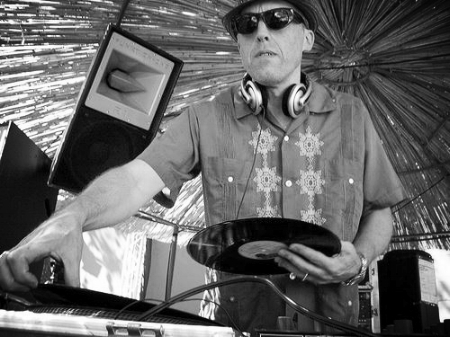 When the Half-Lights blog started one of the first people I contacted was Ole Smokey, a DJ and edit producer who I have always admired since first hearing him spin throughout the weekend at The Big Chill festival. He played music on those afternoons that fitted the festival but also stood out a mile from what everyone else was doing - a mixture of hazy tripped out deep jazz, soft rock and soul music. This individuality and approach to music is something that he has carried into his ability to edit music and rework the likes of Annette Peacock, Al Green, Uriah Heep, Minnie Riperton, Nick Cave to name a few. Enjoy the flow of this instalment of Half-Lights, the Scorpions feature in the mix, a band I thought wouldn't be showing up on the blog but I am pleased to be seeing regardless. A big up to Kev for doing things his way too, a proper character indeed. Last couple of gigs were in Manchester DJing with my good friend Chris Maude. First was the Saturday afternoon session at Refuge, nice vibe, nice mix of people and later that night The Devil’s Jukebox which is hosted by Chris and Fritz Lakes and is one of my all time fave gigs to share music. In 1968, when I was 10, we moved from London up to Chester and my new best mate at school had an older brother who was in a rock band and had loads of records. I’d go round there and we’d listen to all this amazing music from Fairport, CSN, Jimi Hendrix, Led Zep, Pink Floyd etc. It was music beyond our years and it’s when I began wanting a more alternative musical soundtrack and an alternative life to be honest. The first album I bought was Led Zep 3 in 1970. When did you start DJing and what were your first memories like of spinning music to an audience? I was quite a late starter to DJing because it wasn’t really a goal. Around '88 I bought a couple of decks and a mixer and just made tapes for friends and DJ’d with my mates band at a few pub gigs, but no proper DJ gigs. Then in '92 I went out to San Francisco and became friends with a couple of ex pat DJ’s from the UK. I’d been collecting Jazz and Raregroove since the early 80’s and was finding loads of stuff out there and they were blown away by it. I have James and Gavan to thank for either directly or indirectly helping me to become a DJ. I honestly can’t remember the first proper gig I played. It was early '93 and was either the Bulletproof Boat Party, the opening night of Mushroom Jazz or the start of a Sunday session called Boogie Buffet. It was probably the Boat Party. James and Gavan had okayed it with Eddie O’Callahan (years later one of the partners of the Garden Festival) to give me a bit of their sets, but as it was last minute I wasn’t on the promotion. I was really nervous because it was usually house DJ’s on the boat and James and Gavan played house and breakbeat so I was worried about upsetting the crowd. I came on after Gavan and my hand was shaking when I put on the first record which was Eric B and Rakim’s ‘Don’t sweat the Technique’ and it just went boom on the dance floor. The set went great, a mix of Jazz, Latin, Hip Hop, Funk and Disco and Eddie loved it because he wanted more of a mix of music on the boat. He asked me to play on the next one and a few months later he asked me to be a partner. About the same time I was playing some tunes early on at a night James and Gavan promoted and a girl came in to see the owner. It turned out she was Mark Farina’s girlfriend and she asked me if I would like to be one of the residents alongside Mark at a new acid jazz night she was promoting called Mushroom Jazz which was a massive success from the first night. Fate stepped in again while I was DJing at a loft party with another ex pat, Felix the Dog. It was very hippy, lots of incense burning and we were DJing sat on cushions on the floor. I was playing lots of deep jazz like Duke Pearson’s ‘The Phantom’ and Sabu Martinez ’Afro Temple’ and another promoter happened to be there and asked me to join Felix, James and Gavan for a new Sunday session he was starting called Boogie Buffet. He wanted me to start at 8am in the main room of San Francisco’s “Super Club” 1015 Folsom. The sound system was built from the blueprints of the Sound Factory in New York so sounded amazing. The whole roof slid open so the sun shone in. They had bean bags and cushions on the dancefloor and they’d give everyone free breakfast. The idea was that by the afternoon we’d have them dancing and his rule was, play anything, but no house music. They had house DJ’s in the other smaller room. The first day there were only about 30 people in the main room and the other room was packed, but within a month or two it had reversed and the main room was packed. I’ve always played rock in my sets and I remember the first time we had a full dancefloor, dropping ‘Strange Brew’ by Cream and the whole dance floor turning round and cheering and waving peace signs because of course San Francisco was the centre of the Psychedelic Rock scene. So I was very lucky considering I wasn’t a known DJ and my timing for heading out to San Fancisco couldn’t have been better. All those years of clubbing and collecting on the Jazz scene in the 80’s had stood me in good stead and I stayed out there promoting and DJing for 11 years. The edits that you make have introduced me to a lot of artists and music I have never heard of before, how do you look for the music and what is usually the first thing that sparks your interest in making an edit of a track? In 2005, when I knew I was going out to play the Garden Festival the following year, I decided to seal myself off from what anyone else was doing and stayed away from DJ sites and blogs or any trends that were going on. Things would filter through, but on the whole I tried to plough my own furrow. Being a bit of a hermit and living in Chester made that easier. I also decided that, as I was going to be playing three five hour afternoons in the sunshine, I’d concentrate even more on the mellow side of the rock genre. I’d come across some great rock blogs on the internet that had nothing to do with the DJ scene, they were just fans talking about the music they loved, whether it was Folk Rock or Prog, Ambient or Jazz Rock and these became stepping stones to more and more blogs all around the world. There would usually be snippets or downloads to listen to and if I found something I liked I’d buy it on Ebay and use Youtube to listen to their back catalogue which would lead to more stepping stones to other similar music. I would also use Youtube to go through the back catalogues of well known artists. For instance, take the band America. I realised that, like most people, I only knew ‘Horse with no Name’ and ‘Ventura Highway’, but they’ve got a massive back catalogue. I found a wonderful track on the ‘Harbor’ album called ‘Are You There’ which was the first edit I uploaded to Soundcloud in 2012. I have always been a big fan of Gilles Peterson since I first heard him DJ at the Wag in ’84, so I was really chuffed when he got in touch to tell me he liked it and had played it on the show and asked me to send him some more. He’s played quite a few on his show over the years. Around that time soft rock had become a big trend and AOR Disco got in touch about it. What no one knew was that like a lot of the edits, I had about 200 at the time, the America one was seven years old. I started making the edits because I was finding lots of tracks that were great, but would have a jangly bit or a cheesy vocal or something else that didn’t work for me, so I’d take those bits out and then tinker with what was left. If I ended up with something that worked as a complete track then great, if not, I’d bin it. I also started applying the ethos of the Disco DJ’s in the 70’s and 80’s who started by chopping and splicing tape to extend the groove in a section of the track. They were making their edits to enhance what they were doing as DJ’s and I was doing the same thing only it wasn’t for dancing. For a long time I was very hesitant about going on Soundcloud even though friends and DJ’s at the Garden Festival had been telling me for years to get on there. It was one thing to play the edits while people were chilling at the festival, but it was another thing altogether to put them up for scrutiny because a) I didn’t think I was doing that much to the originals and b) I thought the fans of the original artists would be screaming sacrilege. I have my lovely mate Andy (Mr Scruff) to thank for finally coercing me one night to get on there and it definitely helped a lot that he followed me. To my surprise I found that people got what I was doing with the edits and I haven’t heard one cry of sacrilege. In fact I finally stopped worrying about that when a Grateful Dead fan got in touch to say they loved what I’d done with the ‘Fire on the Mountain’ edit. You don’t get any more devoted fans than the Deadheads! At that time and even when I first went on Soundcloud years later, I didn’t know there was an edit scene. I’d heard a few things by Ashley Beedle and a few others that I really liked, but I always saw them as remixes even though they were called edits. My rule of thumb is, it’s only an edit if it’s done with a single track and only uses the source music, a bit like using tape. If multi-tracks are used with just the source music then it’s a rework and if you add bells, whistles or beats then it’s a remix. But that’s just me. My favourite edit of yours is your edit of Roberta Flack - I Can See The Sun, what made you choose that record? I’d known the song for a long time and had always loved anything that had a deep souljazz sound, but I didn’t really like the main vocal part and I never played it out. So I had a go at doing an instrumental with the vocal chants, but hit a wall and put it on the back burner and carried on with some others. Then a year or two later a friend I’d met at the Garden Festival uploaded an edit of it to Soundcloud and it inspired me to go back to it. It’s definitely the most difficult one I’ve done, took a long time. I admire your bravery to also have a mess with Kraftwerk - Computer Love, what was it about that record that you thought could do with editing? I don’t really see it as brave, I’ve learnt to trust my choices and not worry what people might think, but I understand what you mean. I just thought it would be cool to have an instrumental of it, although I called it an instrumental dub as it has some vocals left in. I haven’t checked, but I seem to remember there being instrumental dubs on some disco remixes in the early 80’s by the likes of Larry Levan where some of the vocals were left in. I also like leaving vocals in that are quite chanty so I call them instrumental chants. What software do you use to make your edits? Audacity. It’s free and does the job. I don’t need anything more complex as I only do single track editing. Are there any other DJ's/producers who you admire that edit music? I may be spacing and deserve a slap for forgetting, but I can’t think of anyone making edits that I would call true edits, but again, that’s my opinion of what denotes an edit. As far as remixers or producers, there are quite a few. To be honest, I still don’t follow what’s going on in the music scene so I haven’t a clue what new music is coming out most of the time, but saying that, I’ve picked up some really nice things over the years by, among others, Paqua, Seahawks, Psychemagik, Paul ‘Mud’ Murphy, Begin, Mr Scruff, White Elephant, Coyote, Jeremy Sole, La Homage, Virgin Magnetic Material, Dj Supermarkt, Ashley Beedle, Lexx and a bunch of stuff on the Aficionado and Claremont 56 labels. I always think your approach is fairly unique in comparison to the traditional disco approach, particularly around the music you choose to edit - is this a natural decision or do you make a point of working with more obscure music? I think that, unlike most DJ’s doing edits and remixes on Soundcloud, I didn’t come to it through the prism of the House music scene, my roots aren’t in House Music, they’re in Rock, Jazz and Funk. The disco approach is most prevalent because they want it to be a hit on the dancefloor. Nothing wrong with that, it’s just not the way I approach it. Even though some of my edits work on the dancefloor, it’s not the main focus. I don’t like most of the discofied Rock edits and remixes I’ve heard, I’d rather hear the originals, but there have been some exceptions like Psychemagik’s ‘Everywhere’, Ashley Beedle’s ‘Time is Running Out’ and a few others, but on the whole I’d rather not hear ‘repetitive beats’ added to a rock song unless it’s done really well. It doesn’t matter if the music is obscure or not, it’s all about the song. The sound of it, the groove, the soul. There is a lot of obscure stuff, but there are also classics like Gil Scott Heron and J J Cale and even golden oldies like David Essex and Bobby Goldsboro that you can hear on Radio 2. I can tell within the first few bars if it’s got potential. Then it depends on what’s in the rest of the song and how it’s structured that will determine if it will be a vinyl buy for the song to be played as is, or to be converted for an edit. If neither, then it’s on with the search. It’s hard to explain my approach, but I suppose the edits are just the originals with ‘a bit more or less of the original’ if that makes sense. So I will never play the original of say, the David Essex ‘Rock On’ edit because it’s got that extended intro and I’ll never play the original of the Lucio Batisti ‘Amarsi Um Po’ because it’s got the instrumental intro and the vocal chant section is longer and is reprised. But I can only take a small amount of credit for it sounding great because that’s mostly to do with the original artist, because the edit only contains the original music. I’m just doing a bit of rearrangement. You have had the joy of DJing at The Big Chill and also being a resident at The Garden Festival, what were your memories of both festivals? I came back in 2003 and joined my old partner Eddie O’Callahan at the Magnet nightclub in Liverpool as the enetertainment manager and also DJ’d in the bar. The Magnet closed in 2005 and Eddie and his family had moved out to Croatia because Nick Colgan was laying plans for a music festival and Eddie was going to be a partner. I went out there a couple of times, one time to DJ the very first boat party on the Argonaut. It was a wrap party for a Punk weekender some friends of theirs were putting on and me and Eddie played punk and reggae all night. It was ace. Then in 2006 me and a load of DJs from Manchester and Liverpool all headed out to play the first Garden Festival. I went out a month or two before the opening to help get the site ready which was a great experience and also led to me getting to know a lot of people in the village of Petrcane where it was being staged. They were forced to put the festival on in June at the end of the storm season, so it was overcast and rained a bit, but I don’t think anyone noticed because it was such an amazing vibe and the festival site was incredible. Friends who had been at the first Big Chill said it felt the same. The first one only had about 800 people, who mostly came at night and there were only 150 from the UK. The following year there were 1800 people, half of which were from the UK so the word of mouth had got around about what people had missed. It was also held in July so the weather was perfect. The first two festivals have always been my favourites. I played all three afternoons and even though very few people had heard me play Eddie knew I would look after the daytime sessions and play the right music for the sunshine. I might be wrong and I didn’t really know it at the time, but I don’t think anyone was playing in the same way as me. The closest would’ve probably been the Balearic DJ’s like Moonboots and Balearic Mike, but I hadn’t heard of them and didn’t even know there was a Balearic scene. I was playing on a massive Function One system on the Main Stage and the music covered all the nearby areas where people were chilling, including a section of the beach. It was heaven! And of course there were the boat parties on the Argonaut. After putting on about 50 boat parties in San Francisco and thinking all that was in the past when I came back, here I was back on a boat on the bay, playing to a sunset again. I’d played a lot of sunsets in San Francisco and many more in Croatia, the best two sunsets in the world according to Alfred Hitchcock. I became friends with Mr Scruff after he came to play at the Magnet and then later he played at the first Garden Festival. He played every year and once he clocked what I was doing he invited me to join him at the Tea Tent at the Big Chill and Latitude festivals. It was such a great place to play, a little oasis where, like the Garden Festival, I met so many lovely people. It was a real honour to share music with him and the other DJ’s who also became friends. It also had that added factor of the unconverted passers-by being curious and digging the music. And I was playing on a Function One again! Lucky me! These days, where do you currently feel most comfortable DJing? Amongst friends, especially when they are on both sides of the decks, but I do like it when there is a mix of the converted and unconverted. I love it when someone, who’s not from our neck of the musical universe, comes up to tell me how much they’re enjoying the music and want to know “what is it” and “where can I find it”. That’s why I like playing at somewhere like Refuge in Manchester. There are lots of groovy people who get what you’re playing, but there are also lots of people who haven’t heard any of this music before, because it’s a hotel bar which means they have tourists and other random people coming through. Same with a festival like the Big Chill or Latitude. At the Tea Tent you’d be amongst friends and people from our music scene, but there would be loads of people passing by who had come to the festival to see this or that band, but suddenly hear music they’ve not heard before, but they like it and are drawn in. For me, the DJing has always been about connecting with people through the music, whether it’s other DJ’s or the people who are experiencing the music. When I play out I never plan what I’m going to play, but for mixes I don’t record them live because I like to plan the flow of the mix from beginning to end because it’s out there representing me and I want it to be the best experience possible for the listener. The edits are digital of course and then some like the Paul McCartney track only exist on CD so are ripped to a digital file and some like the Lonnie Liston Smith and John Renbourn are converted from the vinyl. Then they are uploaded into Audacity where I can change the order or replace a track with something else. I can also tweak the beginning and ending of a track so they flow together better. Not mixing them, but a feel thing. It can take a long time, I think I spent a few evenings on this one. The music is a selection of recent finds and older stuff that feels right plus I always feature some edits that haven’t been uploaded to Soundcloud yet. I’ve found so much music watching films over the years and if the film is not well known then it’s possible that the song that I’ve just discovered isn’t well known either. Five of the tracks on the mix are from films. I also like finding something a bit obscure by a well known artist especially if it’s got a bit of a story behind it. The Paul McCartney track is one such find. For some reason he was in Nashville in 1974 and went into a studio with some of the members of Wings and laid down this track. Either in that session or later on, a brass track was added. The version with the brass was released that year as a B-side of a 45 under the guise of The Country Hams. It wasn’t added to the Speed of Sound album in 1976, but was included in the 1993 reissue. The backing track wIthout the brass surfaced on a bootleg CD in 1994 and has only appeared on bootlegs since. As far as I’m aware it has never been released on vinyl, bootleg or not. I hope I’m wrong as I’d love to find it on vinyl, it’s a personal holy grail. I used to read a lot, but I can’t seem to stay focused on a book anymore, my mind starts wandering. I prefer to watch films. I have a huge collection of obscure cult films, foreign, noir, silent, classic stuff, new stuff. Obvious TV faves, The Wire, First Season of True Detective, Stranger Things, The Twilight Zone, Fargo, X-Files, Game of Thrones, Seinfeld, Original Twin Peaks, Mindhunter. Less obvious, the original House of Cards, Laurel & Hardy, Alistair Cooke’s America, The Vietnam War, New York – A Documentary Film, Robinson In Space, Edge of Darkness, Robin Redbreast, James Burke – Connections, Dekalog. I’ve been into vintage clothes and hats since I was 16 and have a huge collection of guayaberas (Mexican wedding shirts) that just keeps growing because there are so many versions and colours. I love cycling, I cycle every day as I don’t own or want a car. Sushi! Spiced Rum! Proper Coffee! Just to say, love the blog and thanks for inviting an old geezer to waffle on about the magical musical experience that has made the last 50 years such a great journey.